The US Army is working on a real-life Iron Man suit, and the first prototypes are coming later this week. But yesterday I got a sneak preview of one of the many clever components. It's not a rocket launcher or a bulletproof shield, but it does a very, very important job: Keeping Iron Man's head up. Officially called Tactical Assault Light Operator Suit (TALOS), the project to build a suit for super soldiers isn't the work of just one organization. Instead, dozens of smaller contractors have divvied up the work into small, bite-sized challenges that will ultimately be woven together to create a fully-functioning suit. Creative Engineering—based in Bronxville, New York and designers of everything from toy robots to electric guitars that never go out of tune—found itself in charge of making sure that a super soldier's insane helmet loaded with thousands of dollars of next-gen gadgetry barely feels like it's there it all. If you haven't warn a full-on combat helmet recently, I wore one yesterday and let me tell you they are pretty heavy. No, it's not like you need to work out before you can manage or anything, but these aren't bike helmets; these are hefty pieces of gear designed to hold up in combat. And five pounds of helmet can feel like 500 pounds after hours and hours of fighting, especially if night vision goggles are in the mix. Even that is nothing compared to the sophisticated heads-up displays, sensory equipment, ballistic shield visors, and other high-tech wizardry that will find a place on a TALOS soldier's head. Put succinctly, Iron Man's helmet is going to be freakin heavy. Which is where Creative Engineering comes in. 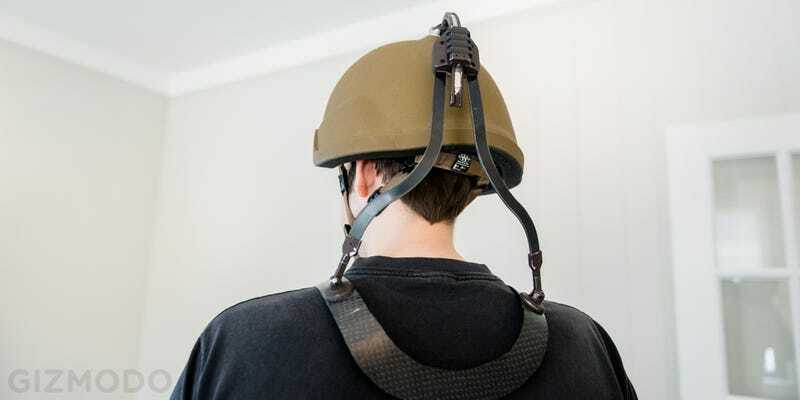 You might think the solution to make a heavy helmet loaded up with 10 or 20 pounds of high tech gear feel weightless would be something equally bulky and sophisticated, a robotic neck of some sort. The actual solution that Creative Engineering came up with is far simpler. Essentially you just hang the helmet on your head. It's a system called VLOS—Vertical Load Offset System—because everything has to have an acronym. VLOS can't magically make a helmet lighter, but it can create that illusion by off-setting the weight from your comparatively sensitive neck to your far heartier shoulders. And boy does it ever work. Unfortunately it's not very good at making me look badass. Because there are a whole bunch of different companies working on different parts of the TALOS suit, and Creative Engineering is only one of them, I could only try the VLOS system in a vacuum, a simulation of what this tech will look like in action. But even in isolation the effect is impressive. An absurdly heavy helmet that made it difficult to tilt my head without succumbing to inertia and crashing my ear into my shoulder suddenly felt utterly manageable with the help of VLOS. A full neck workout turned into a minor discomfort. A lighter helmet felt almost non-existent with the rigging attached, more hat than armor. The way the VLOS system achieves this is both super simple, and surprisingly nuanced. At its heart, VLOS is just using the resistance afforded by two flexible metal bands to offset the weight of the helmet. Simple. But in order to minimize the system's profile and keep it from snagging on stuff and to allow soldiers a life-savingly full range of motion, Creative Engineering designed a clever multi-part attachment piece they call "The Cobra." Its arched form can roll backwards and forwards to accommodate a nodding motion, and the bearing at its tip rotates side-to-side to facilitate tilt. The Cobra let me move my head anyway I liked with no resistance from the weight of the helmet. In its place was just a soft ka-chunk-ka-chunk of passive metal machinery, a sound that will surely add to TALOS armor's I-am-basically-a-freaking-cyborg appeal. Again, the VLOS demo we got just shows the system in isolation, offloading the weight of a hefty helmet onto a shoulder yolk. In the actual TALOS prototype—one of them at least; there are three different ones—the VLOS will be integrated much deeper and will lock into the actual suit itself, providing its function in concert with dozens of other equally impressive and important pieces. So while the first iterations of an Iron Man suit may be a little more stripped down than the full on suit of armor you might be envisioning, ingenious but simple innovations like this are the key to keeping soldiers mobile even as we load them up with more and more gear. Crazy VR night vision, heavy bulletproof visor-screens, head-mounted computers that make the Oculus Rift look like a toy: they'll all only possible thanks to clever hinge.